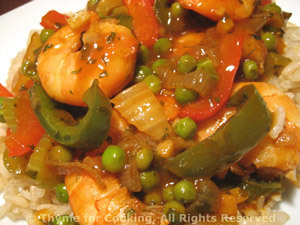 Stir-Fried Shrimp, Peas, Peppers, Thyme for Cooking Chinese main course. Colorful, flavorful, simple. Add red pepper flakes or bottled hot sauce if you like it hot. Slice peppers into strips and cut in half. Cut onion in half and thickly slice. Cut celery at an angle into thin slices. Rinse peas in hot water to thaw (if frozen). Add red pepper flakes and sauté briefly. Add onion, peppers and celery to skillet and stir-fry for 2 minutes. Add peas and stir-fry 1 - 2 minutes. Add chicken stock, tomato paste and sherry, cover and simmer 2 minutes. Uncover, add cornstarch mixture, stirring until cleared and thickened. Arrange Basmati on a large platter. Spoon Shrimp and Vegetables on top and serve.